Hello, if you came here seeking the October Stamp of the Month Blog Hop.....please scroll down! 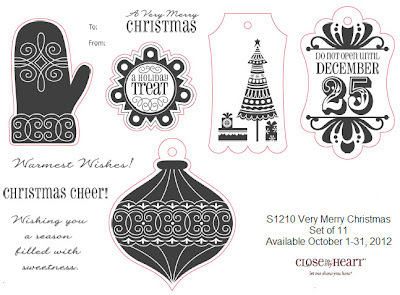 This card was also created with the October Stamp of the Month, Very Merry Christmas! Today, starts the beginning of a new challenge at Christmas Cards All Year Long. The challenge this month is to create a Christmas card with one of two options: Using traditional stamps with non-traditional colors or non-traditional stamps with traditional Christmas colors. I chose to use the traditional stamps and go with non-traditional Christmas colors of blue and brown. I must admit, it almost seems like I am cheating! 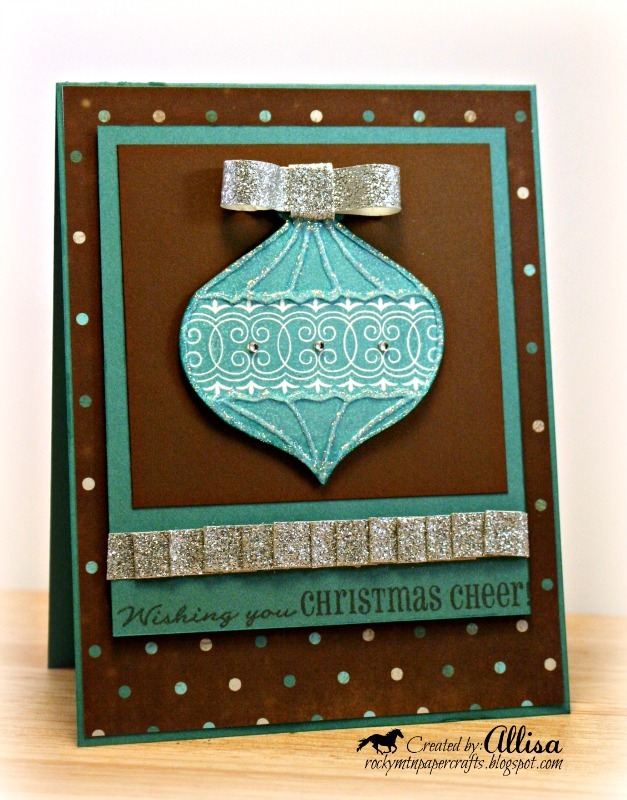 I use brown and blue so much for my Christmas cards that they are almost traditional colors, at least in my craft room! I am not sure why my camera is not liking my twilight ink....in person my stamped ornament is the same colors as my mat color. I suppose it has to do with how the light bounces off of the solid cardstock vs the stamped image. My card is created with the October Stamp of the Month, Very Merry Christmas. This stamp set can be yours for as little as $5.00 with a qualifying purchase. Here is a look at the complete stamp set. You will notice all of the images are outlined in red. The red lines are not part of the actual stamped image. The red lines indicate that a coordinating shape is available on the Cricut Artiste Cartridge. Such a fun stamp set for the upcoming holiday season. My silver trim is the new adhesive backed Silver Shimmer Trim. This trim is great for making ruffled trim and adds instant bling to your project! Don't forget about my October Mystery Hostess drawing. Receive one entry into the drawing for the hostess gifts for every $25 in products you purchase. Last month's winner received $80 in free products and the option to purchase any two items in the catalog for 1/2 off! If you place an order through my online store, click on join the Oct Mystery Hostess to be entered into the drawing. E-mail orders are also accepted. Please contact me with any questions! Thanks so much for stopping by! I can't wait to see your creations at Christmas Cards All Year Round, you have all month to enter! Lovely details and the colors are wonderful for a winter card! Wonderful color combo Allisa! I love the ornament and design. Great inspiration. "Hugs"
This is gorgeous! Love the colours. Thanks for playing along with Skipping Stones Sketch this week. Oh this is gorgeous, love the colours and the bauble. Beautiful card!!! Love the colors and your ornament !!! Thank you for joining us at Creative Inspriations challenge this week! Love this! The paper pleating is divine! Thanks for sharing your talent with Skipping Stones Design! Love this card! The colors are stunning and the ornament is so beautiful. I like the previous card a lot too. Wonderful Christmas creations! Hugs! Beautiful card, I love how your ornament really stands out. Thanks for joining in on the fun at polka doodles. Stunning card - love the colors here. Thanks for playing along with my Amusing Challenges and I hope you'll check out the winners!